Needs approval to operate out of county-owned building. A new healthcare collaborative might be coming to the Island. This year, Island Health Care has expanded into the public health field. Cynthia Mitchell, CEO of Island Health Care, presented Oak Bluffs selectmen with a plan Tuesday night to establish a healthcare collaborative to create a needs assessment for the Island’s public health services, and a performance measurement, to give towns a better understanding of how their money is being spent on health and human services. As part of that public health outreach, Mitchell proposed utilizing some of Island Health Care’s recent $3.4 million in funding to create a nonprofit healthcare collaborative. The collaborative would invite regional organizations involved with health and human services to work together with the goal of collecting data for an ongoing needs assessment, and creating a plan to respond to those needs. The collaborative would also measure the performance of the various health organizations. The Island spends more than $1 million a year to fund the Island’s regional health services. Each year, leaders of the Island’s regional services ask for funding at town meetings. All Island towns contribute to regional health services, but the funding formulas, based on population, require Oak Bluffs to bear a significant burden of their cost. Many of the nonprofit regional services are also based in Oak Bluffs. Mitchell proposed establishing the collaborative — which would include a few members of her staff and their new mental health and substance use access coordinator — on the second floor of the Center for Living building in Tisbury on a no-cost three-year lease. 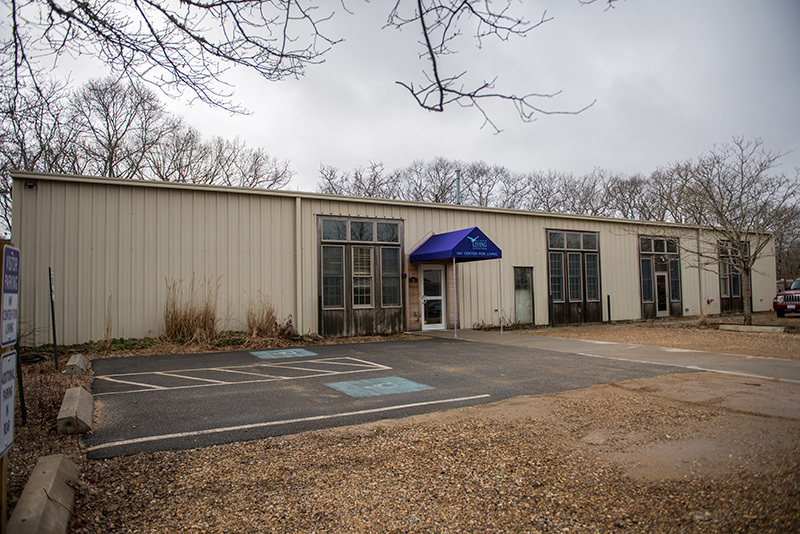 Island towns gave the county approval to purchase the building at 29 Breakdown Lane in Tisbury for the Center for Living. In the past two years, county manager Martina Thornton has advertised the second floor for leasing three times, but failed to rent it out. The space is completely finished with three offices, a reception space, and a meeting room. Thornton said the county commissioners and Chilmark selectmen both approved the proposal. Thornton has meetings with the other Island towns to receive their approval. While the collaborative would not pay rent, they would pay for a portion of the building’s utilities. The fair market price for the three-year lease is $40,000. Once all towns approve the lease to be rented below the market value, Thornton will have to get final approval from the County Advisory Board. Mitchell made it clear the collaborative would not offer services, instead focusing on administration and meetings between public health organizations. Selectman Brian Packish said regional services can ask towns for money, but don’t have a “gatekeeper” to assess them. Packish added he was OK with leasing the second floor for no charge because the collaborative would more than make up for the fair market price. “I do actually support this … for the measure of performance,” Packish said. Other selectmen agreed with Packish that bringing the organizations together would have the potential to improve them and give selectmen a better idea of how funds are used. Thornton pointed out organizations can address needs and issues just by coming together in the same place. “I view this as an opportunity to collaborate and streamline. Just by getting people at the same table to talk about a service and how it’s provided or not provided in each agency is a good starting point. We have seen big movements just by getting the different players in the substance-use world together at a table once a month. We have seen new services — improved services — just by being able to collaborate,” Thornton said. Selectmen then voted 4-0 to amend the regional agreement to lease the second floor of the Breakdown Lane building for below market value to a nonprofit that will provide a public service. Chairwoman Gail Barmakian said she supported the collaborative, but abstained from the vote because she did not have enough time to study the new agreement. In other business, the Cape and Vineyard Electric Cooperative (CVEC) updated selectmen on its study for a solar installation on the town’s capped landfill. The installation would be similar to ones in the other Island towns. “It’s a great use of a piece of land that otherwise couldn’t be put to use,” CVEC programs and administration manager Liz Argo said. CVEC is also looking into installing a lithium battery storage system to create an energy microgrid that could power the waste treatment facility, the Department of Public Works building, and parts of the Oak Bluffs transfer station during a grid outage. Barmakian raised concerns with a lithium battery. Argo said CVEC would continue to study the potential for the installation and battery and keep the town updated. MV Salads, a planned salad takeout counter, was approved for business. Owner Susanna Herlitz-Ferguson said her business would be located on 55 Circuit Ave., and plans to sell mostly locally sourced salads. Herlitz-Ferguson hopes to be open for business by Memorial Day weekend. Another locally sourced food business plans to open in the downtown area. David Keefe plans to operate a new farm stand at 28 Kennebec Ave. that would sell mostly local vegetables, fruits, and prepackaged meals. Keefe will return to selectmen after submitting a business license application.